Home Property News Are sea views a price driver for Phuket condominiums? While Phuket is an island, most property buyers are led to believe that sea views or proximity to the ocean are a key driver of real estate value. Fact or fiction? According to data from leading online marketplace FazWaz.com the answer lays inside the numbers. Looking at Phuket’s primary and secondary condominium sector and analyzing pricing points from the ocean up to ten kilometers inland, what is clear is developers and sellers are not maximizing what is one of the leading USP’s in the trade – location, location, location. 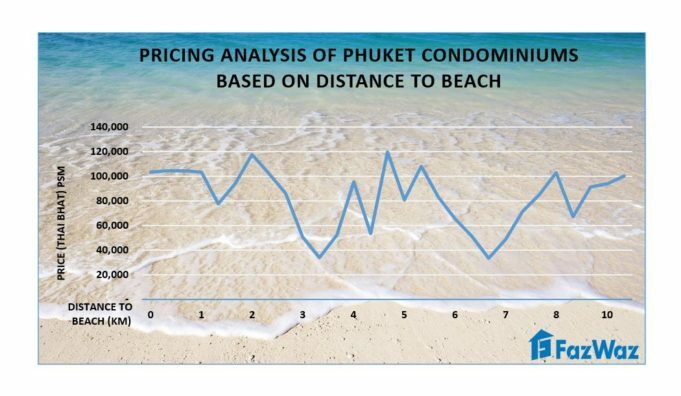 Based on the Phuket numbers the average value of condominium units located from the oceanfront up to just under two kilometers away is THB100,000 per square meter, while the number actually escalates up to up to THB117,000 psm at a distance of two kilometers. Getting inside the data, what has driven the later number is actually views versus direct proximity to the beach. Once you move inland on the island and the views disappear, the mean average rapidly drops dramatically to THB34,000 per square meter at midway point between three and four kilometers to approximately THB34,000 psm. The storyline here is how developers have used low-cost land and delivered entry point pricing. Underlying land cost remains a critical component of ultimate condominium pricing throughout Phuket. As you shift away from the beach to increasingly urban areas inland from four to six kilometers, the pricing surges upward again with much product in the THB80,000.00 per square meter to 120,000.00 psm tier. This recurs again when viewing city properties of eight to ten kilometers with pricing averaging THB80,000 psm to 90,000 per square meter. Urban land prices and strong demand are key factors propelling numbers. What is clear in the FazWaz data are two things. First is that unlike many comparable resort real estate markets, that developers have been unable to maximize premium pricing levels in relationship to properties near to the ocean. Sea views seem to still carry greater weighting with both developers and owners. Second is that inland properties are rapidly pushing up in value as a result of key commercial, retail and transportation infrastructure. In a nutshell moving into the next decade Phuket’s property story is not just about the beach.